I have been born and brought up in a city called Gorakhpur in Uttar Pradesh which happens to be one of the closest to India-Nepal border. Still, I never went beyond Bhairahawa (a town on the Nepal border) and Butwal (22 kms from Bhairahawa) that too with the school picnic. So, this time when my sisters and I along with our husbands planned to visit Gorakhpur for a wedding my father chalked out a 3 day trip to Nepal. The itinerary included Pokhara and Kathmandu. A winger was booked, bags packed and we set out on our journey. After a 2 hour drive we reached Sunauli (Indian town on the border). We crossed into Nepal and headed to a restaurant for lunch as our driver went to finish some paper work. At the restaurant, we were received by a weedy eyed waiter who sleepily took our order. Time passed as we patiently waited for the food. After 30 mins or so my father himself went into the kitchen to inquire. We were then informed that no restaurant keeps food ready in Nepal. So, that was our first lesson; order well in advance. After lunch we proceeded to Pokhara which is a 6-7 hours drive from Bhairahawa. On this drive we found out that our driver was quiet a Gorakhpuriya (my friends from that part of the country will know that term). A typical Gorakhpuriya is a person who will never give a straight answer to your questions, will always be angry, will have complete disregard to what you want and will think that he’s doing you a favor even when you’re paying him for his services. And. to our amusement, his name was Vijay, so we chose to call him ‘angry young man‘. However, the drive was pleasant and filled with scenic beauty and we enjoyed it to the most. We reached Pokhara around 9.00 pm and as per the first lesson the first thing we did was order food. So while we checked in our hotel to freshen up our dinner was getting ready. As we were planning our next day the driver broke the news; ‘Kal Pokhra band hai…chakka jam. gadi nai niklegi‘ (Pokhara is closed tomorrow, no vehicle on the road). Since democracy has taken over in Nepal, a city or the other is closed every now and then.There went our plan. 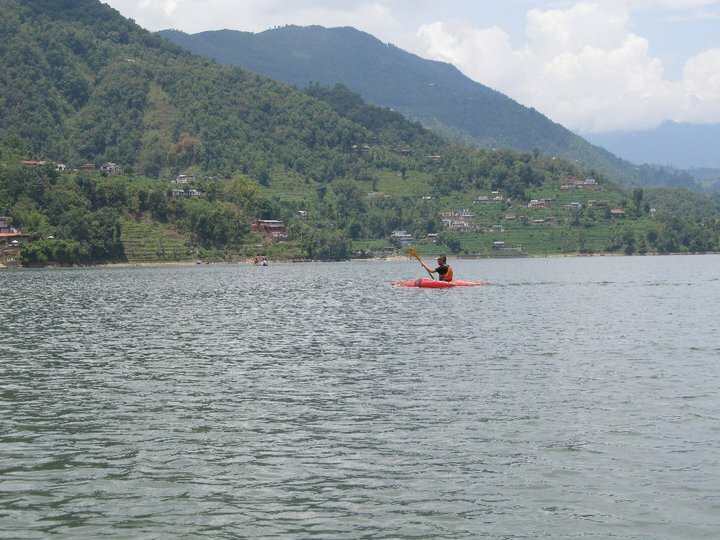 The next day we set out on foot, had our breakfast by the famous Fewa lake and went on a boat ride. The lake surrounded with tall mountains was absolutely enchanting. There wasn’t much to do after that since the shops too were shut. We were told that the ‘bandh‘ will be over by 4 and then we can go sight seeing. So the youngsters decided to pick up few bicycles and go for a ride while the elders rested. We rented the bikes (cleaned them and pumped air in the tyres too 😛 ). We din’t go far when the first one got punctured….and after a while the second one too…an hour was spend trying to mend them but in vain. We went back and immortalized the saying ‘khaya piya kuch nai, gilas toda barah ana‘ (don’t ask me the meaning now). After lunch at Laxman’s restaurant and Bar (I must admit, the yummiest momos I’ve ever had and some great fish curry with rice) it was time to get the wheels out. 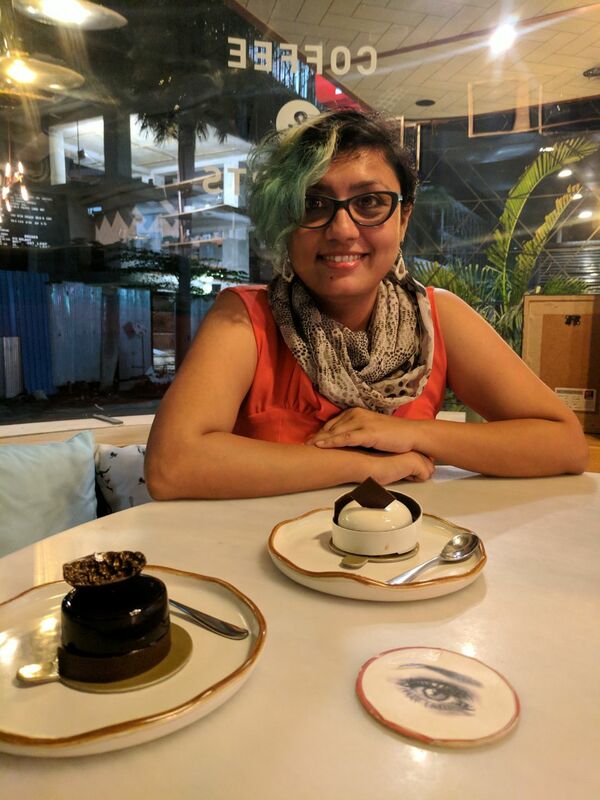 As we moved towards the Devi’s Fall we found out that the band wasn’t over yet and sensing danger went in a casino (and blew off some money too 😀 ). We came out after 20 mins and finally went on to see the Devi’s fall, Gupteshwar cave and Bhadra Kali temple. As we were heading back to our hotel from Bhadra Kali temple it started raining and there was a sudden urge for ‘garam chai‘. We went in a small tea shop. Since it was raining and we are Indians, we also wanted some ‘pakoras‘ but the shop owner didn’t sell any food. So, we offered to make them ourselves in her personal kitchen if she gave us raw stuff, which she did. And there were hot pakoras and ‘adrak wali chai‘. Amongst this merry making we forgot to talk money and the shop owner charged us a hefty 500 Nepali Rupees for that. But our ‘angry young man‘ intervened and we paid only 300 NC. We went back to the hotel, planned our next day which was to see the sunrise point and head to Kathmandu. The day was pretty much over for the senior people but the ‘young gang’ was not done yet. It was my husband’s birthday the next day so we planned to head out for a couple of drinks. We found an amazing restaurant at the lake side where the bartender mixed up some flaming cocktails for us. Next morning we went to the sunrise point. 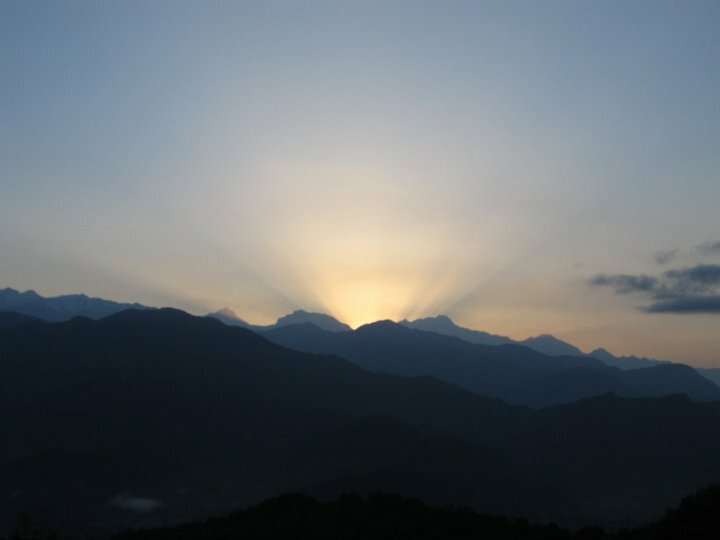 The Himalayan ranges (annapurna, dhaulagiri) turned beautiful golden as sun cast its rays on them. The sight was breathtakingly beautiful. After a cup of tea and some light breakfast we started towards Kathmandu, again an 8 hours drive from Pokhara. We reached Kathmandu at around 3 in the afternoon, checked into the hotel and as we were going out for lunch another bomb blasted. Kathmandu was also closed the next day (21st May). Since we had a flight to catch from Lucknow on the 23rd we only had an evening in Kathmandu. We planned to make the most of it and decided to visit the Pashupatinath and Swayambhu temple right after lunch. Thankfully the restaurant in Kathmandu had the food ready and our order arrived in 10 minutes. As we were going towards Swayambhu from Pashupatinath, our winger broke down and we waited for another one which took us to the temple. Swayambhunath or The monkey temple as its famously called (because of the resident monkeys) is set atop a hill and is visited by Budhists all over the world. 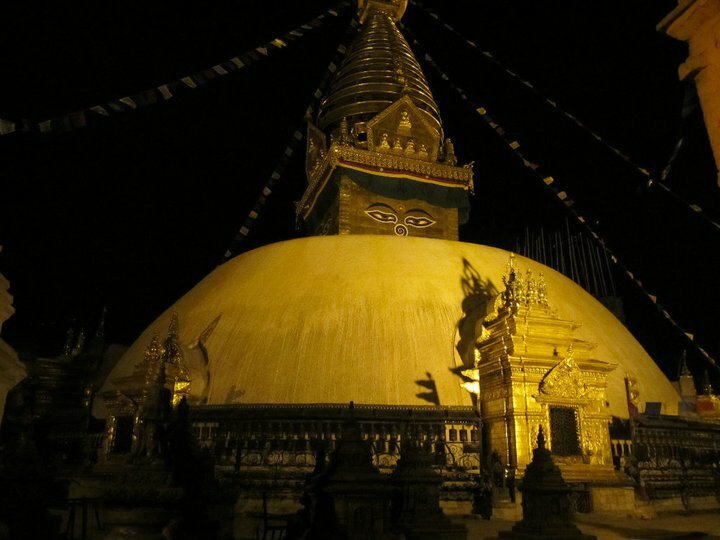 The Stupa is beautifully lit and you can see the whole town from the top. After the temple visit we came back to the hotel and planned to leave early in the morning as Kathmandu was ‘bandh‘ and yeah…our car had broken down so we had to adjust ourselves in the smaller one. 9 of us in a Tavera. We started towards India. On our way we stopped at Manakamna temple. 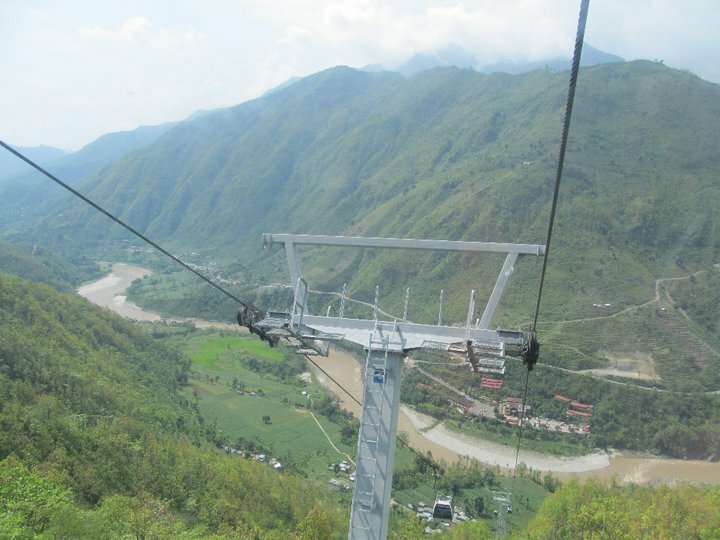 The temple is accessible through a cable car from Kurintar, 2 hours drive from Kathmandu. To our relief there wasn’t much crowd and we got into the longest cable car in Asia. 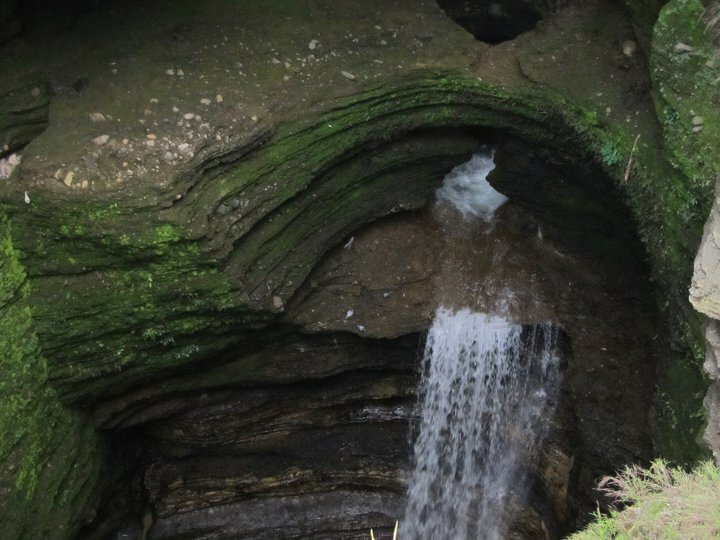 It crossed through 3 hills with a river flowing at the bottom. The car ride was amazing but to our bad luck the temple was closed for a special pooja. We chose to have breakfast instead and then took a cable car back to Kurintar. Well, the ‘bandh‘ didn’t just leave us there. As we were on our way back the cable car also stopped for a couple of minutes. But it wasn’t scary and we had a nice view of the hills. Praying no more ‘bandhs‘ on our way we headed straight to India. Nepal is a beautiful country but is heavily affected by the current political scenario. So, if you are planning a trip to Nepal make sure that you don’t bump into a ‘bandh‘.